Nick Rhoads, Glen Brandenburg and Nate Hamilton partnered up to start a new Wendy’s franchise. Wondering how to become a Wendy’s franchisee? Click here to learn more, visit our FAQ page, or contact us directly at wendys.franchising@wendys.com. Picture 5th Ave. in New York. Okay, now picture 15th Ave. in Ardmore, Oklahoma. Where would you expect to find two Wall Street investment bankers in the primes of their careers? That’s correct: chowing down on Spicy Asiago Ranch Chicken Club sandwiches and Dave’s Doubles® at the Wendy’s® restaurant they recently built in a tiny southern Oklahoma town. In 2016, Nick and Nate left high-flying careers at the center of the financial universe to form Heritage Partners Group and, thus, start the process of joining the Wendy’s family as franchisees. 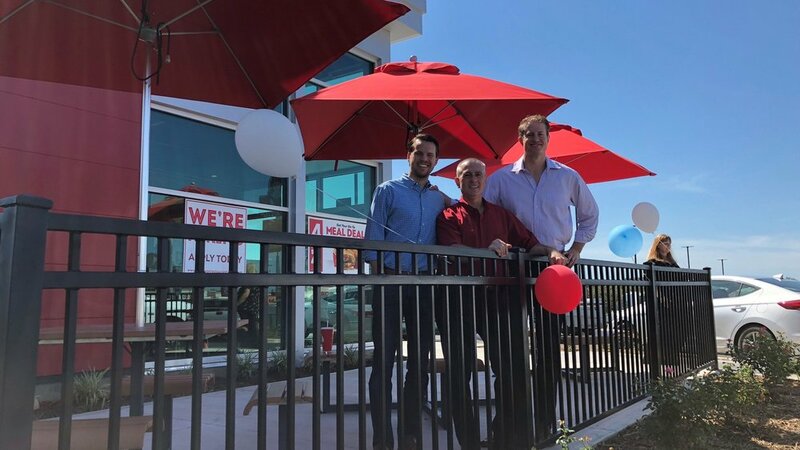 After 18 months of tireless due diligence, enabled primarily by their deep business and market research experience, Nick and Nate celebrated the grand opening of their Wendy’s on 15th Ave. in Ardmore this past August – their first new-build as franchisees. And it all begs the question: why? With their decision to partner with Wendy’s solidified, Nick and Nate needed an experienced operating partner. A person who could tell them how things really work. A person who, even better, spent a large chunk of his management career with Wendy’s. A person like Glen Brandenburg. “I wanted to get back into a role where I could have direct impact on front-line teams and customer service,” says Glen, who worked 15 years on the corporate side of Wendy’s operations before taking a brief hiatus in 2016. Glen now serves as President of Stonewall Road Restaurant Group, which is owned by Heritage. With Glen at the helm, Stonewall Road acquired 19 existing Wendy’s restaurants before it built the Ardmore location. Three new restaurants have already broken ground in North Texas. In fact, the booming growth throughout Texas encouraged the team to get started on building new restaurants early, and the team has scheduled 10 new restaurant builds for 2019 in the state. A significant reason why Stonewall Road was able to get its business off and running was the support they received from Wendy’s corporate team. Our Founder, Dave Thomas, was happiest when he could help someone else succeed. Stonewall Road was founded on that philosophy as well. Nick, Nate and Glen all agree they’re looking most forward to bringing Stonewall Road’s mission statement to life, to serve as true partners to Wendy's, its management team and its Stonewall Road team members. And, of course, its customers.